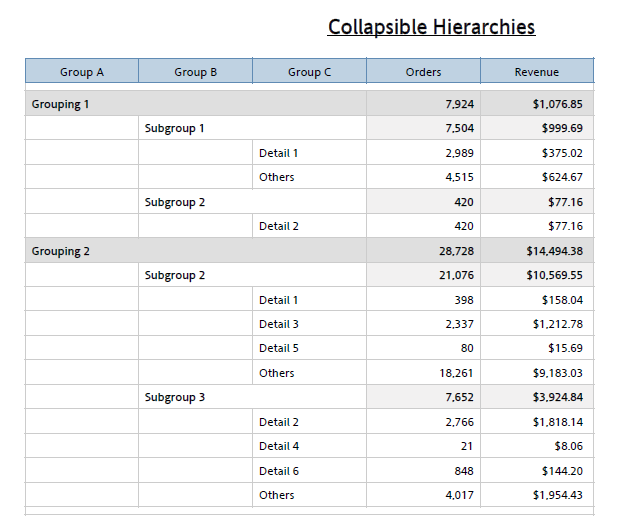 Collapsible hierarchies are useful when you have multiple levels of grouping and subtotals in a report and you don't want to display all the data at once. When the report loads, it should display only the top level data. Users should be able to expand the group value that they are interested in and the sub groups for the expanded groups should display. If there is another level within the subgroup, then the users should be able to expand the subgroups as well. In Essence, the Report Studio list report should behave in a fashion similar to, but not the same as, an Analysis Studio report. This is an indirect way of achieving drill down functionality for relational data. This can be achieved using a drill through report with itself as target, but the advantage of this approach is that the uses will see the results instantly without having to rerun the report. This is fine if the number of rows is less. As the data set grows, there might be too much data crammed in the report that the users can't analyze the data better. Users can collapse the groups by clicking on the - icon next to the parent. 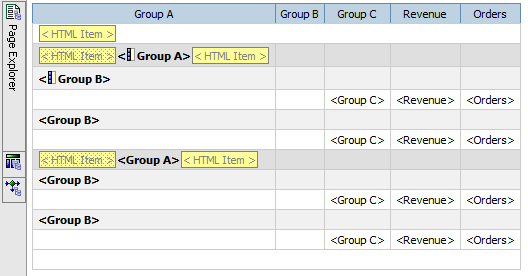 It looks very similar to the report in HTML format when all the groups are expanded, but the +/- icons are missing. Group columns A and B. From the "Structure" menu, go to "Headers & Footers --> List Headers & Footers". Alternatively, you can use the "Headers & Footers" icon in the toolbar. Now, CUT (don't delete) the details section of Group A and Group B (see selected items in the above image). 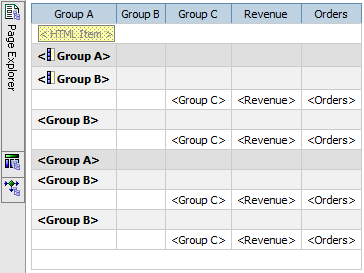 Next lock the items and from the Insertable Objects Pane --> Data Items tab, add back Group A and Group B to the beginning of the list report. Once again Unlock the items and CUT "Group A" and "Group B". Next, unlock the cells and drag "Group B" to the second column. The first script, which is also the main script will be placed in the "List Header". In the image above, it's the first blank row below the titles. Let's call this "Script 1". The second script is a wrapper script that will be placed around "Group A" and "Group B". This script will make the entries clickable. Let's call them Scripts 2a and 2b. The last script (Script 3) will be placed in the list footer. This script will collapse all the headers when the report loads. All it does is to call the StartHidden() function defined in the Mater Script. Now, if you run the report, it will load with all the groups collapsed (as shown in the 3rd image from top). Hi Sriram: This is a very good concept. Thanks for sharing it. Question: Is the JS compatible on C10 environment for Cognos as well? Hi Kavitha, Thanks for the comment. The script uses only HTML DOM objects, nothing Cognos specific. So it should work fine with Cognos 10. Thanks CognosTech. My next post is about dynamic sorting. I finished that script just a few days ago. @CognosTech: I have published a post for Dynamic Sorting. Check it out. Just displays the headers no detail. Dean, I haven't tried it on 10.1 yet. I will check it and let you know. I am also trying on 10.1 I think the problem is related to the plus minus images. Either they are not on the server, or they are in a different location. I don't have access to our server to find out. Is it possible to do the same with a textual plus minus icon? OK, I have messed around with this for a while, and I am now pretty sure that the reason it isn't working is because the images are missing. Basically the way it works is when you open the report, it looks for an image at the start of the row and hides all rows where there isn't an image in the first column. I am not getting any images (because the address isn't valid on my server), and therefore all rows are being hidden. You can trick it by putting any old image there, but this doesn't really give you the desired outcome! I have been able to get (+) and (-) to display instead of the image using div tags instead of img, and I can even get it to change from a "(+)" to a "(-)" when clicked, but can't get the hiding working because this bit needs the image.... catch 22!! NOTE: I had to change "div" to "d_iv" and "span" to "s_pan" because these posts are filtered for HTML code. It doesn't look like that in my report!!! Does this work with Firefox ? I couldn't make it work with FF. Yes, I was able to make this work in both IE and firefox. I don;t know if anyone is having difficulties with this on 10.1.1 but I found a link on the ibm site. This actually has working script for 10.1.1 and it also has code for 8.4 and 10.1 I've not tried these. They are xml report definitions so you to use the page how to structure the report. Awesome, I struggled with 10.1.1, but the link worked a charm. Hi Sriram, how are u? First, congrats for your great job! I have a list in a Cognos report, with 5 columns, which is: Owner, Type, Currency, Code, Sub-Code and Revenue ($). be part of that collapsible hierarchy. 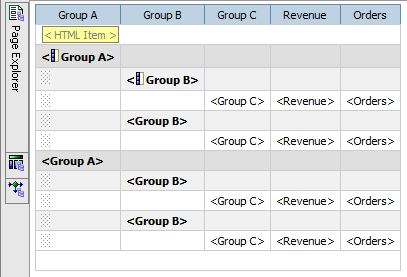 Do you believe that is possible to implement this feature for a specific column inside a list with another columns? Were you able to do this? I need help on similar scenario. Is this concept possivle in a crosstab report? Thank you for the great article! Hi Pedro, I haven't tried this approach with crosstabs. But it should work for crosstabs too. Hi Sriram, I have a collapsible cross tab report in HTML. When user clicks "Export to Excel", all the hidden columns reappear. Can we just export only those rows that have been expanded (unhidden)..
Expanding/Collapsing happens only at the browser level. So when the report is exported, the all rows will be exported. But, I would like the report to start when all the coloumns are expanded rather then closed up like they come now. Try this, in the Master Script there is a function called "StartHidden". This function is called during the page load and collapses all the rows. That should do the trick. But for ease of following I would recommend renaming the function to StartExpanded (instead of StartHidden). If you do this, don't forget to change the name in Script 3 as well. I have Cognos 10.2 and the above code is not working. I have the image files in place. I have even noted the your modifications for 10.1 but its still not working on 10.2. All I get is the list Header names. That's it. Rest is all blank. 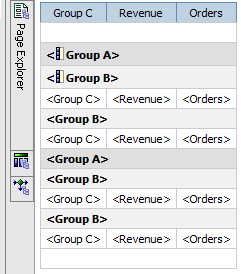 From the IBM link (For Cognos 8), I get the images and also get all the groupings on the screen, BUT clicking on the Plus sign is not working. Great article and a huge help! Is there a way for users to expand all or collapse all ? All of my drill up/downs work perfectly however I would like to give my end users an option to expand all or collapse all hidden rows with one click. Just wondering if anyone has been able to get this to work in a crosstab. I'm sure there are some sublte changes required but I've not been able to discover them yet. 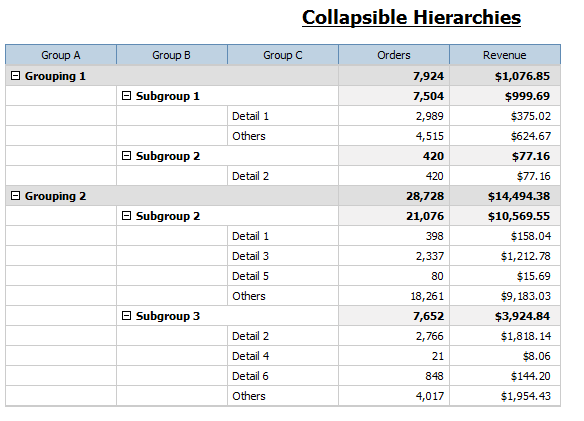 its working fine,but when I run the report in Excel format the "Collapsible Hierarchy " feature does not work. Can any one please tell me why it does not work ? Or is there any other way to achieve the above ? It uses HTML tags and works for report output in HTML only. In Excel, you will get expanded view and see all rows. Thanks for posting this code. WIth little tweaking of image path to my server having + and - images, it works wonderful. I have used this in multiple reports. Now, client wants collapsible hierearchy for two lists side by side. Its working fine for list on left but no luck for list on right. I get expanded data in right list instead of collapsed view. On deleting left list, it works fine for right list. But problem using collpasible hierarchy code given by you for two lists side by side in a report. Got it resolved. If anybody gets stuck on this issue, I will help. Hello ! This solution is great !!! Can you please let me know how you fixed your '' two lists side by side '' issue ? I need to collapse and expand in crosstab . 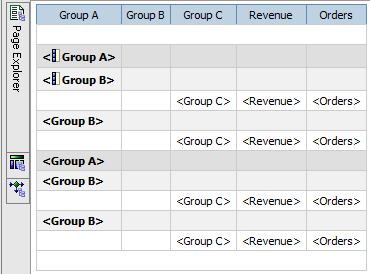 When I am applying all the rows below it getting collapse instead of group by group. 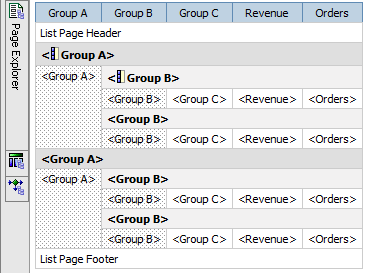 Placed separate members for each row instead of a hierarchy. First up thanks for the example. I've been testing this in 10.1.1 and 10.2.1 and the function works great. My problem is performance between browsers. Operating systems tested (XP and Win7 64 bit). There is a delay during rendering and expand and collapse of upto 2 minutes at the worst case. FF and Chrome take 10's of seconds to open and sub seconds to expand or collapse. Just wondering if anyone else has experienced this browser issue? It works very good with my IE 2008.OS Windows 7. Don't know how it works for other browsers. Is there a way to show the oveall totals at either the top (list header) or bottom (list footer)? 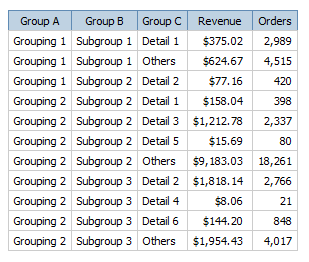 This method only allows you to show the grouped totals, unless you either expand all or export to Excel/PDF. Is there a modification we can do to the script that will always display the list header or footer, so I can show the totals there? Iam currently working on 10.1.1 version with a report studio with a cube as the source.I have tree prompt which has hierarchies by names and has mutiple levels under each name.The report has 2 sections summary and detail.When i select the first name the report runs fine in both summary and detailed page.If i select name 1 and name 2 the summary page picks up only the first name whereas the detail lists the children as well.I used MDX functions for the summary parent(selected children) and for the selected children i use descendants(set(#promptmany). I have the code working for one list object on a page. I'd like to add a second list to the same page. When I do so, the 2nd list renders with everything uncollapsed by default. Any ideas on why or how to have the 2nd list initialize collapsed? thanks! problem solved: modified the StartHidden() to take a parameter and passed the name of the span object. I have the report with sectioned output on Month. My requirement is to show and hide the corresponding month using + and -. I have used the same logic shown above. When I run the report the output is not generated as Collapsed. I now the function StartHidden() is not woring in my case. I have 12 elements in the list and grouping done on one column only can you change the StartHidden() function for this requirement. I have placed the function in list footer only. This script works with grouped columns, not sections. Thank you so much for this great article. Through this java script code, we are either able to show all sections expanded or all sections collapsed. Can you please help me with this scenario -> I want some of the sections expanded and some as collapsed. Thanks again. Are you talking about how the sections appear when the report loads initially? Yes Sriram. Initially when report loads for first time, I need some sections expanded and some sections collapsed. Thanks. That is tricky. During the initial load, the function StartHidden() in the main script goes through all the rows and hides the child rows one by one. In order for this to be partial, you should be able to identify the rows before the report is run. How do you know which rows to show and which ones to hide? Can I hard code, i.e row 1 expanded and row 2 collapsed ?? You cannot do that, since you don't know a) how many rows the report is going to have b) which row is a parent and which row is a child. That's why it's based on grouping, not hard coding. Hello Sriram. Initially can I make decision of collapse/expanded on the basis of plus/minus icon ?? when the report loads for the first time ? Sriram the report does work for my case as of now but the next request for me is to provide headers on top of it which does not work in my case. The HTML items does not allow me to show it in the report? any one tried in the Crosstab report, i have one requirement on Crosstab. please post the code for me. Thanks. Sriram, it is not working when there are multiple levels. In this case, only the last node is getting expanded/collapsed. Hi Sriram, First great script by the way...made my work a lot easier. I can't believe C10 doesn't have this functionality out of the box. I have 5 list reports. The first always opens up collapsed, however, the remaining 4 open up expanded. I simply copied the HTML objects from the first list report to the rest. Do I need to do something special to have the remaining 4 lists to open up collapsed as well? How did you implement the 4 lists. Did you copy paste the master script into each one of them? Did you make sure, the startHidden() function is in the footer of all the lists? You could rename the function to startHidden1(), startHidde2() etc. I tried to implement this solution into a CrossTab but it works only for 3 or less levels hierarchy... I suppose that it sees each row as a sublevel of a parent row instead of see groups of rows as a one row. But i could skip something. Did you try to implement the above code into a CrossTab? Hi Sriram, this technique is so useful , one can just say number of comments we have. Can this is be applied in Active report? Thanks for your post. Initially when we load the report it shows + sign beside each of the level1 item even if there is no lower level present for that particular level. Is it possible to make it dynamic so that only when lower levels are present then it will show + sign else it will show -. Thank you very much for your post. It is working good. I have some trouble to build thisexpand and collapse report now everything is fine. It is working good in cognos 10.2. Thanks again. Thanks for the blog. It worked for me with 3 issues. 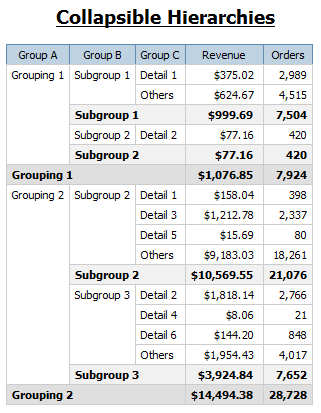 2)The sums of the orders and revenues is not appearing one the group header level while the report is collapsed. Would you able to help ? or anyone who has faced this issue already. ? Does this method for unbalanced Hierarchy ? Is there any option for excel output? I mean when we run the report in excel format, it should come with collapse expand feature like you did for html. Anyone has any idea about this? Please help. The script works great, thanks for posting it. 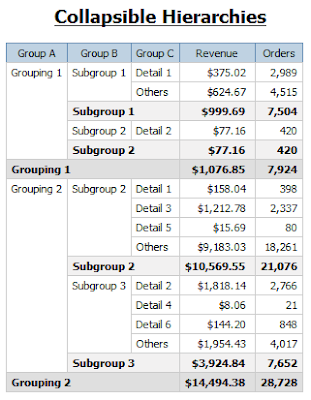 I have a question though, I have added an overall total for each column and on the initial load of the report the overall total shows but when i expand and collapse the last grouping the overall total collapses into the grouping. How would the code be tweaked so that the final grouping won't include the overall total/list footer in the collapsable rows? Can you please update code for Cognos 10 version.